I cam across an interesting gem of an article in the Independent thanks to Byliner. In it, Deborah Orr, looks at the unexpected political statements and significance of this year’s Oscars ceremony. It might be a couple of days old but well-worth the read. This entry was posted in Life Rants Updates on March 31, 2003 by Jon. I wasn’t entirely sure what to expect from The Recruit except that I would probably fall for Colin Farrell. Al Pacino plays, what turns out to be, a very strange CIA recruiter. He recruits James Clayton, a talented computer science graduate played by Farrell, to the CIA training facility (aka The Farm) where he is put through a series of challenging tasks with his fellow recruits. Upon leaving The Farm his first assignment is to follow fellow trainee Layla (Bridget Moynahan) who is accused of being a double agent. Of course James must fall for Layla and he must question his loyalty to Pacino (who adopts a surrogate father role). Sadly we rarely see anything about the work of the CIA itself – after The Farm we are kept in the character’s sealed world. It is, however, a thriller with a series of twists and turns that makes for a great evening out. UPDATE: 30 March: Colin Farrell is Man of the Moment. This entry was posted in Films (aka Movies) on March 29, 2003 by Jon. NEW YORK — Federal investigators have arrested an enigmatic Wall Street wiz on insider-trading charges — and incredibly, he claims to be a time-traveler from the year 2256! 2004: Gay Weddings This Week? This entry was posted in On The Web on March 28, 2003 by Jon. This entry was posted in Photos on March 28, 2003 by Jon. Has the tide turned for free online content? I’d love to see all web content free but it’s not practical and I take it as a sign that the industry is growing up and getting real. It will be interesting to see what happens in a year from now when, hopefully advertising revenues are up a little. Will it swing back in favour of ad-revenues? Luckily, I don’t want to read them! This entry was posted in Online Advertising on March 28, 2003 by Jon. If you don’t share with people that this feature exists how will anybody know to adopt it? It could be argued that by trying to seamlessly integrate Trackback and hiding the workings you are inhibiting people’s understanding. Thus, when Tom says, “No-one’s going to get it until everyone’s using autodiscovery” I would have to disagree. Trackback must not become a clique for those in the know and the only way for that not to happen is to be more obvious with its existence. People don’t know you have utilised Trackback. How is a reader to distinguish between a link you are actively promoting and a Trackback (something an author may not even know is there)? Linking (especially without comment) implies some kind of approval (yes, sure that’s a sweeping statement but how many times do you link to something you disapprove of or disagree with and not indicate it?) and, as a blog is personal publishing, an author needs to be clear about what’s a personal approval and what’s not. So, this very train of thought means I am going to have to re-design my own site as I have it set up to seamlessly integrate Trackbacks into a post. Maybe I won’t get time to move on to my other thoughts. 2004: Where Was The Coloseum? This entry was posted in On The Web on March 27, 2003 by Jon. This entry was posted in On The Web on March 26, 2003 by Jon. Where does Britain go next? 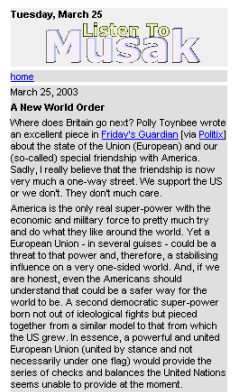 Polly Toynbee wrote an excellent piece in Friday’s Guardian [via Politix] about the state of the Union (European) and our (so-called) special friendship with America. Sadly, I really believe that the friendship is now very much a one-way street. We support the US or we don’t. They don’t much care. America is the only real super-power with the economic and military force to pretty much try and do what they like around the world. Yet a European Union – in several guises – could be a threat to that power and, therefore, a stabilising influence on a very one-sided world. And, if we are honest, even the Americans should understand that could be a safer way for the world to be. A second democratic super-power born not out of ideological fights but pieced together from a similar model to that from which the US grew. In essence, a powerful and united European Union (united by stance and not necessarily under one flag) would provide the series of checks and balances the United Nations seems unable to provide at the moment. Depending on your viewpoint, this war may (or may not) be right in many ways. Regardless we are there now and we are fighting alongside the US and other nations. When the dust settles on Iraq – as it eventually will – what will the new world order be like? Will we follow the US into any nation they care to wage war against (rightly or wrongly)? Can we still hold our head high at meetings of the EU and look our neighbours in the eye? Are we capable of stepping back and looking for our appropriate place in the new world order? I hope we can. This entry was posted in Life Rants Updates and tagged politics on March 25, 2003 by Jon. Obviously, war is an unpleasant business. Depending on your viewpoint, being a prisoner of war could be better or worse than being on the front line dodging bullets. When it comes to being a prisoner of war, the Geneva Convention governs the way you should be treated. I have always assumed that countries just paid lip-service to the convention and the realities of war made battlefield adherence almost impossible. Obviously, with the detaining of prisoners on both sides The Convention is important in the Iraq conflict. But, who decides what is humane treatment (article 13) or respect for honour (article 14)? While having a brief look at The Convention, I came across The International Committee for the Red Cross’ pages on their work in Iraq. It’s almost been overlooked – as news media scramble for their own (exclusive) view on the war – that there are some more impartial observers. In reality, of course, the good people who work for the Red Cross must have opinions on the war but their daily reports make an interesting, alternative reading. This entry was posted in Life Rants Updates on March 24, 2003 by Jon. According to MSNBC earlier this week, 43% of users think that online advertising is a nuisance and, in another survey, 53% respondents said online clutter was a problem [both via Marketing Fix]. Of course, consumers do not like advertising. Nobody likes being advertised at, just as everybody believes that they are not swayed by advertising (but they know people who are!). Is this a big deal? Well, of course, no advertiser wants to believe their advertisement gets in the way and no advertiser wants to annoy users to the extent that they are turned off the product by the commercials. 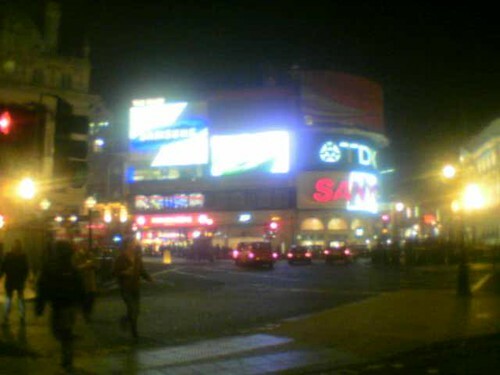 Yet, as noted in many places, TV advertising is the most intrusive advertising – the programme physically stops so they can show you an advertisement. So, why does online advertising come in for such a hard time? Badly designed advertising can be a nuisance but I think advertising isn’t generally too much of a problem. What I am interested in is the concept of clutter. So many sites these days surround you with advertisements. Banners at the top, buttons down the left, a skyscraper on the right and some kind of rich-media thing walking across the middle. There’s a very large portal who does this kind of thing all the time. They’re making money but it’s very frustrating. I’m sure cleverly designed advertising in the right place works – in all mediums. The online challenge is to make it work and make it profitable, at least profitable enough to pay for the sites we like. This entry was posted in Online Advertising on March 20, 2003 by Jon.